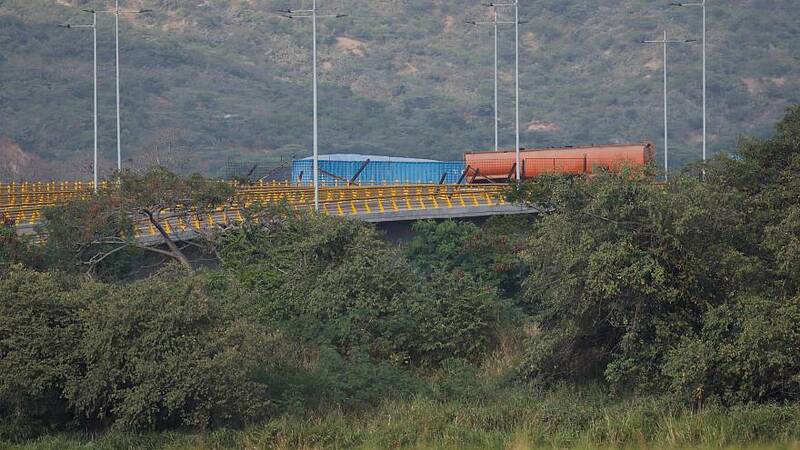 The first trucks of humanitarian aid have arrived at Venezuela's border with Colombia — but they were not allowed to enter the country. Pressure on Maduro to receive the aid convoy mounted after a European Union-backed crisis group called for dialogue and elections and warned against interventionism. But Maduro still rejected the aid convoy and several truckloads of food and medical supplies are now being stored in a warehouse at the border. The government of embattled President Nicolas Maduro has vowed to block their entry saying Venezuelans are ‘not beggars’. "The so-called 'humanitarian aid' operation is a show, a cheap show, a bad show," Maduro said in interview with Mexican newspaper La Jornada published on Thursday. "You can be sure that it won't disturb Venezuela." The EU-backed group said Venezuela needed a peaceful and political solution to the growing crisis, at a meeting in Uruguay. "The group aims to forge a common international approach to support a peaceful, political, democratic and Venezuelan-owned resolution to the crisis, excluding the use of force through free, transparent and credible presidential elections in accordance with the Venezuelan constitution," Federica Mogherini, European Union Foreign Policy Chief said. Millions of Venezuelans have left the country since 2015, and around 800,000 have ended up in Colombia.